← QSLing – Is this in the spirit of Amateur Radio? Last weekend I was pleased to take part in the UK DX BPSK63 contest – This contest was RTTY in 2012 but has changed to PSK63 this year. I generally prefer operating RTTY to PSK but there’s no doubt that PSK63 is quicker than RTTY and more stations will fit into the available bandwidth. This particular contest is great for UK stations as QSOs with us count for three points compared with all other countries who count as one point per QSO so as a result, we’re in quite high demand. The contest ran from 12:00 on Saturday to 11:59 on Sunday so I was there on 20m, all ready go to at the start time and it all kicked off very fast and furious as the clock ticked over. Lots of stations were calling at once and it was quite tricky for a few minutes to pull individual callsigns out. The rate stayed nicely high for the first two hours on 20m but then slowed when I shifted to 15m for about 20 minutes so I moved back to 20m where I stayed until 16:08 when I changed to 40m until 17:45. I stopped then for the evening because things were starting to slow down and I was tired! I set my alarm for 06:50 on Sunday morning because I knew sunrise was at 07:55 and wanted to get a good hour in prior to the sun coming up on 15m. I expected the band to be quiet at that time but as soon as I started calling CQ, I was getting replies so I should have been up earlier. I ran until around 08:30 on 15m then moved to 10m for about half an hour before shifting back to 15m but I lost time between at 09:40 at 09:50 where I had to be away from the shack for around ten minutes. I moved a couple of times between 15m and 20m up until the end time at 11:59z. A full analysis of my log can be seen by clicking here (all QSOs are listed as ‘phone’ because I’ve not worked out how to tell SH5 that PSK is data). I ended the contest with exactly 600 QSOs in the log although when I submitted the score, the robot told me that I only had 599 because one was flagged as invalid due to being sent what looked like a serial number rather than the correct exchange. Although the HF bands were in generally good condition last weekend, I was surprised at how few north Americans I worked – I did beam that way for a while on both 15m and 20m but worked just 15 in the USA and one Canadian. I only managed four stations from Japan which also surprised me as I normally have a very good path to JA land. I can only guess that PSK is far more popular in Europe than elsewhere and my log and the map of QSOs below does clearly reflect that. 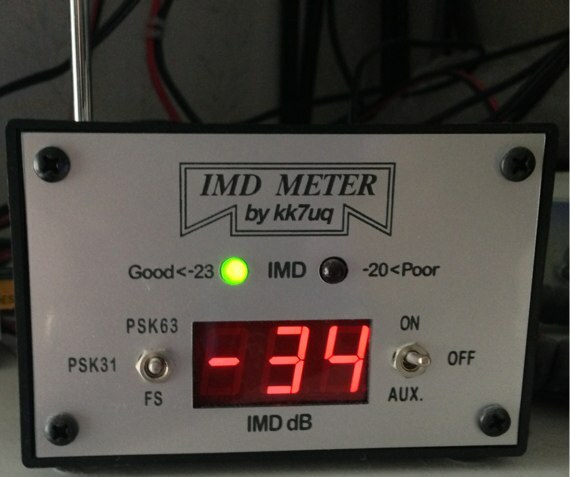 It’s very important when running PSK to keep the signal clean and using the IMD meter I bought a while ago I was able to keep an eye on my signal throughout the whole contest – Here’s how it looked on the meter. There’s a full list of claimed scores here and at time of writing, it looks like I’m in a good position with just a few points separating me and GM0FGI – I worked more stations but he has a few more multipliers so it’ll be a very close run thing once adjudication takes place. 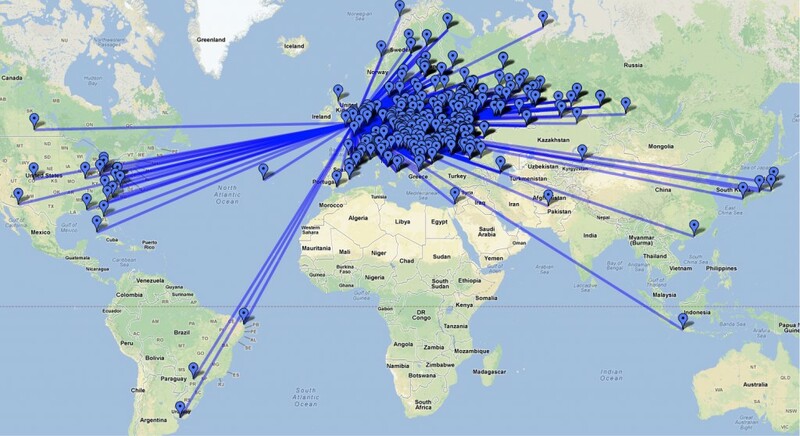 This entry was posted in Amateur radio, Contesting, PSK and tagged PSK contesting, PSK63. Bookmark the permalink.